In the 1960s and ’70s artists in the USA’s biggest cities developed new ways of responding to the urban environment, and recording the communities and people who live there. This exhibition of photographs, films and other works from the period looks particularly at depictions of New York, Los Angeles and Chicago. We asked one of the curators, Alison Fisher, to tell us more. ‘The City Lost and Found’ is a groundbreaking exhibition examining a pivotal shift in American cities during the 1960s and 1970s through the intersection of photography, film, conceptual art, architecture, and urban planning. Breaking from traditional disciplinary boundaries structuring scholarship on this period, the project argues for the collective impact of practices from a wide range of makers and thinkers – from documentary photographers, urban planners, architects, and filmmakers to performance artists – focused on the specific qualities and social potential of urban places. The exhibition provides a unique perspective on tumultuous decades, exploring how images of the streets and events in New York, Chicago, and Los Angeles – chiefly photographs and film footage – had an impact on attitudes and projects, helping to develop new models for architects and planners engaged in the study and transformation of these three cities. One of my co-curators, Katherine Bussard, has written extensively on street photography and began conversations with fellow history of photography scholar Greg Foster-Rice about their mutual interests in this period several years ago. As they began to think about an exhibition, their ideas began to push into the realm of architecture and urban planning. I had recently arrived at the Art Institute, and with my background in architecture and urbanism in this period, I was very eager to be involved with this ambitious, multi-disciplinary project, and the collaboration was born. This one is tough, as there are so many strong and little known works in the exhibition. 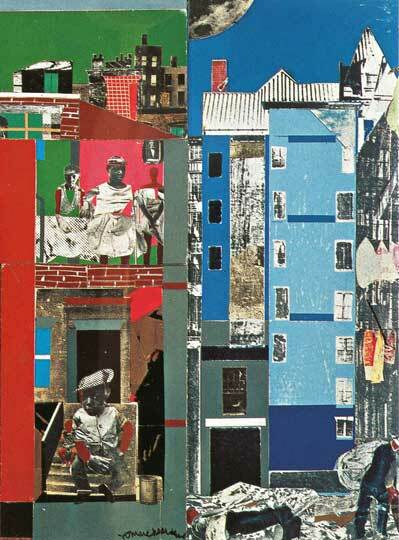 I think visitors will be very excited by Romare Bearden’s monumental collage work Block II (1972) which has rarely been exhibited. We are also debuting several projects that have not been displayed since their making, including a 1967 Happening by Allan Kaprow, titled Moving, and a magnificent rendering by architect Shadrach Woods for Lower Manhattan. As an architectural historian and curator, I rarely have the opportunity to work with such a wide range of media and creative practices. It was great to get back to my roots in art history and discover all of the connections between the artistic, architectural, and urban planning ideas from this era. Working with ephemera! It was really important to us to engage with the images of these cities that circulated in newspapers, magazines, and on television. However, this material is much less centralised in terms of location than works of art, and often required complex usage permissions to show in an exhibition. Certainly worth it though! The galleries (Renzo Piano’s design) have lovely proportions with 15ft ceilings, so we really wanted to take advantage of the height to give a city scale to the exhibition. We did so through film projections, including a Gordon Matta-Clark piece, City Slivers, that is projected to the ceiling, as well as large vertical works such as a map of Manhattan that is virtually floor to ceiling in Manhattan Real Estate Holdings, a Real-Time Social System, as of May 1, 1971 by Hans Haacke, Sol Goldman and Alex DiLorenzo. We had hoped to borrow Ed Ruscha’s master painting, Los Angeles County Museum on Fire (1965–68), which is owned by the Hirshhorn Museum, but it was already committed. In the end though, we found a wonderful film L.A.X. by Fabrice Ziolkowski, which is projected on the wall to function as the signature large-scale work in the Los Angeles section of the exhibition. ‘The City Lost and Found: Capturing New York, Chicago, and Los Angeles, 1960–1980’ is at the Art Institute of Chicago, from 26 October–11 January 2015. Forum: Are online auctions the future of the art trade?